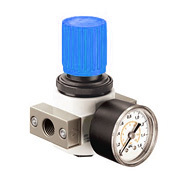 Pressure regulators (pressure reducing valves) maintain a constant pressure output, regardless of changes in inlet pressure or at a variable pressure rate. Pressure regulators are control units, which examines the measurement system pressure at the outlet of the regulator, and shows them by example . Manometer . Pressure control is done mostly through the needle, the knob and the diaphragm. Control system acts directly by increasing or decreasing the pressure and vent the compressed air. Pressure reducers (pressure reducing valves) are characterized by high efficiency (up 3600 l/min). Various port sizes (M5 , 1/4", 3/8", 1/2 ", 1") allows to find a regulator well suited for installation.